Bound to Windsor, here winning the West Virginia Triple Crown Nutrition Breeders Classic. Photo by Coady Photography. Trainer Jeff Runco won nine races at Charles Town Races in the two weeks between our latest rankings and today’s version. That was enough to jump him from fourth place in our rankings to second, less than 20 points behind James W. Casey, who remains in first. Casey has 302.28 points to Runco’s 283.57. The two of them are well clear of other rivals. Our system takes into account wins, win percentage, earnings per start, and wagering return on investment. The trainer leading the colony in each category receives a score of 100 for that category, with other conditioners getting a percentage of that. That would give a trainer leading in all categories a perfect score of 400. In brief, the rating system rewards those who win often and in the biggest races. We applied the stats to every trainer at Charles Town who’s made at least 20 starts and won at least one race. Casey is in the top five in all four ratings categories and is the leader in one. 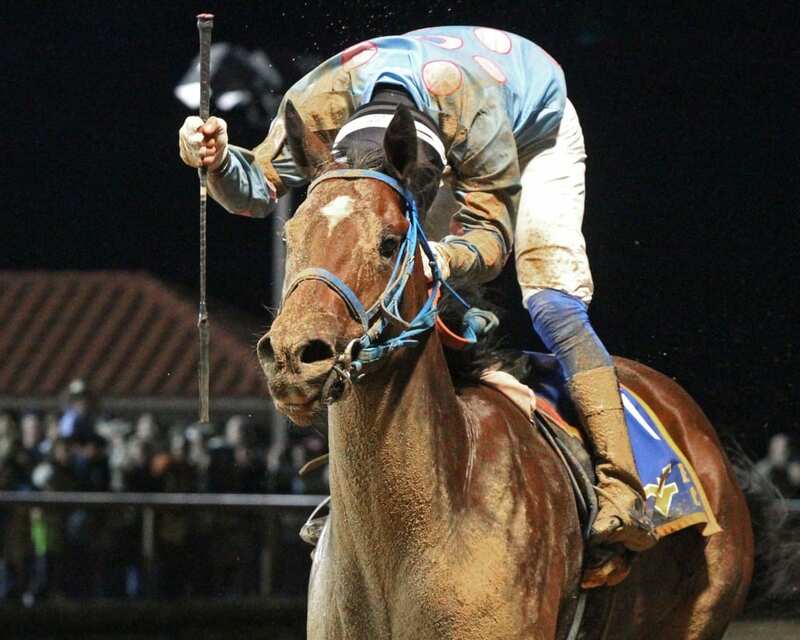 His earnings per start of $4,408 is the highest of all trainers at Charles Town Races. He is also second in wagering return on investment, returning bettors $3.48 per $2.00 win wager on his horses; that trails only Kristy Gazzier’s $4.06 ROI. Casey is also tied for third in both wins and win percentage. The fast-rising Runco has risen to the top of the standings by wins after a torrid March that saw him win 18 times to jump to 26 wins at CT overall. The streak also helped him rise to fifth in win percentage at 21.31 percent and third in earnings per start ($3,572). Those two are followed in the rankings by Kevin Patterson (251.33 points), Ollie Figgins III (243.38), and Ronney Brown (241.28). Patterson, in limited starts, leads the colony with a win percentage of 30.43 percent and is second in earnings per start. Figgins is in the top five in wins, win percentage, and earnings per start, while Brown is second at the track with 21 wins. Trainer Kristy Gazzier, who is sixth overall with 238.82 points, has the highest wagering ROI at $4.06. Javier Contreras, who was fifth two weeks ago, drops to seventh with 218.90 points. The report covers racing action through April 4, 2018.